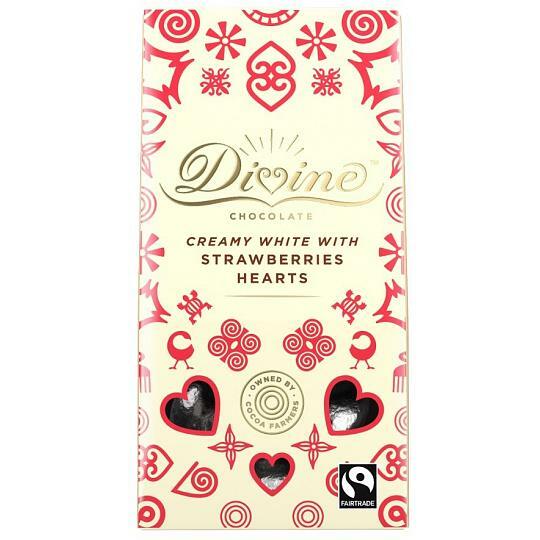 Deliciously creamy Fairtrade white chocolate hearts with pieces of real dried strawberry; a tantalising combination! Each mini, white chocolate, heart is wrapped in silver foil making a lovely gift. 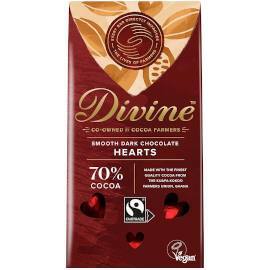 Also from Divine are the Divine Seriously Smooth Milk Chocolate Hearts and the Divine Deliciously Rich Dark Chocolate Hearts, all in the same style box. A box of white chocolate hearts from Divine chocolate, individually wrapped in silver foil. Divine Chocolate Dark Chocolate Hearts, made from, Fairtrade, 70% dark chocolate shaped into chocolate hearts and wrapped in red foil. 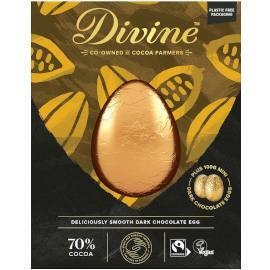 Divine Milk Chocolate Praline Eggs. 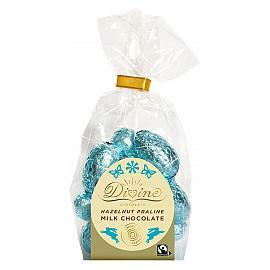 deliciously soft and creamy hazelnut praline filling, surrounded in Divine milk chocolate and wrapped in foil. 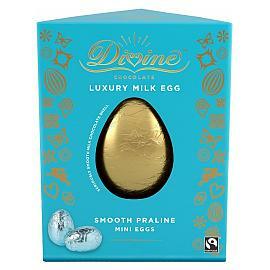 Divine Luxury Milk Chocolate Egg, a Fairtrade Easter egg made from milk chocolate with praline mini eggs. 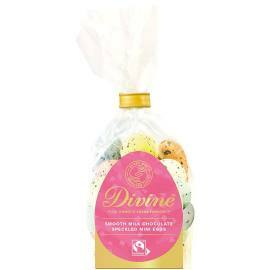 A bag of Divine Milk Chocolate Mini Eggs, individually foil wrapped mini chocolate eggs in a gift bag for Easter. The Divine Luxury Dark Chocolate Egg with Salted Caramel Mini Eggs, a deliciously smooth dark chocolate Easter egg shell made with 70% cocoa and mini eggs. 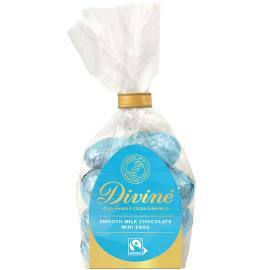 Divine Milk Chocolate Speckled Eggs, a bag of speckled mini chocolate eggs made from Fairtrade milk chocolate with a crispy shell.